The description of the impact of the CPRS with its ETS has been an artful exercise in misleading and deceptive presentation. It is another GST dressed up as a tax on carbon dioxide. It is so general in application that any incentive to change behaviour will come at a great cost. We have heard that our power bills will only increase by a few dollars a week when the average household spends about $1,000 on goods and services each week. We have not been told the half of it. In fact it is worse than that we have not been told the other three quarters! A good starting point is to get the scale of our payments for electricity and gas. 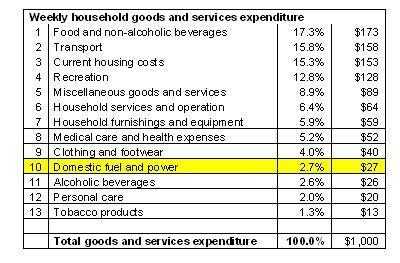 The ABS table below shows that our fuel and power is 2.7% of our weekly household expenditure. The average electricity consumption for a household is 100 kilowatt-hours per week. This will put about 0.10 tonnes of carbon dioxide into the atmosphere at the power station. Domestic use of natural gas gives CO2 emissions of only another 0.05 tonnes. So at $10 per tonne of CO2 emissions this is a cost of $1.50 per week or $80 per year from around eight million households giving the Treasury $600 million. 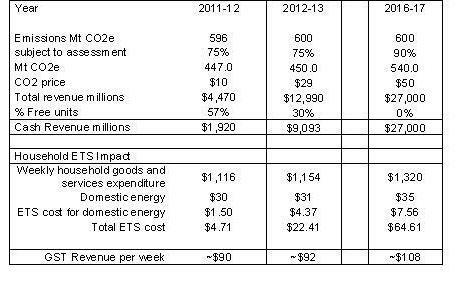 But the Treasury estimates $4.47 billion ETS revenue in the first year, 2011-12. Why the difference and who is paying? The simple answer is of course we, the householders are paying indirectly what is left after concessions are given to the export oriented or intensive energy industries. We provide this revenue through all the goods and services we buy. But we have been promised household compensation at the same time. (it) will use every cent it receives from the sale of Australian emissions units to help households and businesses adjust and move Australia to a low pollution economy. So some return to households from the Treasury is in order and scaling from earlier budgets would suggest a return of $1.30 billion from the cash receipts.. This would give the scheme negligible impact in its first year. For the next year when the carbon market opens, it might be a bit different. The budget papers show revenue of $12.99 billion and cash receipts of $11.54 billion. This is a puzzle as it implies only 11% free units issued while the previous budget showed 30% free units and $6 billion returned to low and middle income households. This is the treatment adopted in the table below. If $6 billion is going to households then that is about $14 per week compensation. Where is the incentive to reduce the energy bill? Just one less ticket for a Fleetwood Mac concert would balance the books for the year. Let us advance to 2016-17. We have agriculture included and we are not giving out any free units. The most striking feature is that we have really created a GST for energy. Domestic power bills only contribute about 12% to the ETS revenue and the total ETS take is the equivalent of boosting the GST by about 60%. An obvious conclusion is that domestic power remains a small component of the household budget. So where are the incentives to change behaviour? The incentives must be in the impact the ETS has on industry. How it will play out nobody knows! There is a long running trend in the reduction of energy and materials going into products from the car to the spectacular changes to the computer but will a tax drive firms to seek competitive innovation? It will certainly spur competitive innovation in minimising tax! The conclusion from this analysis is that the ETS is a blunt instrument for driving changes in energy use. Energy is so pervasive in our activities that this approach will have difficulty getting traction. In fact if most of the tax revenue is to be returned to households then it will wash away the intended change in behaviour. Of course it may wreck some of the asset values for those who own power stations, particularly in Victoria with its low cost brown coal but this may not interrupt the generation of electricity. There is one thing that politicians dare not touch – our petrol prices. This has been exempted throughout this calculation as the fuel excise is reduced as the ETS charge rises. Transport is a big part of household spending. It is second in importance to food but domestic petrol purchases are at about the same level as domestic fuel and power and this scheme does not provide the price shocks that came from the Arab-Israeli wars when there were changes in behaviour. The real and present danger of this scheme is that it presents government with a river of cash. There are many claimants for support apart from the households. The Garnaut Review would have us spend billions on R & D. This scheme provides an opportunity for a massive misdirection of resources. 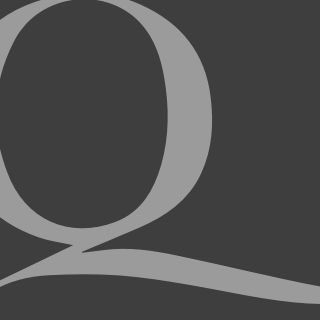 Governments and innovation are a contradiction in terms. We already have a Green Car fund, a National Broadband Network proposal and a renewable energy scheme, each misdirecting multiples of tens of billions of dollars and we now have, in a manner of speaking the appearance of a flood tide. Where is our King Canute?